This is an old revision of this page, as edited by ClueBot NG (talk | contribs) at 23:32, 9 August 2014 (Reverting possible vandalism by 90.244.192.19 to version by Sabrebd. False positive? Report it. Thanks, ClueBot NG. (1917734) (Bot)). The present address (URL) is a permanent link to this revision, which may differ significantly from the current revision. 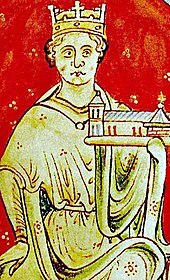 John (24 December 1166 – 19 October 1216), also known as John Lackland (Norman French: Johan sanz Terre), was King of England from 6 April 1199 until his death in 1216. Following the battle of Bouvines, John lost the duchy of Normandy to King Philip II of France, which resulted in the collapse of most of the Angevin Empire and contributed to the subsequent growth in power of the Capetian dynasty during the 13th century. The baronial revolt at the end of John's reign led to the sealing of the Magna Carta, a document sometimes considered to be an early step in the evolution of the constitution of the United Kingdom. When war with France broke out again in 1202, John achieved early victories, but shortages of military resources and his treatment of Norman, Breton and Anjou nobles resulted in the collapse of his empire in northern France in 1204. John spent much of the next decade attempting to regain these lands, raising huge revenues, reforming his armed forces and rebuilding continental alliances. John's judicial reforms had a lasting impact on the English common law system, as well as providing an additional source of revenue. 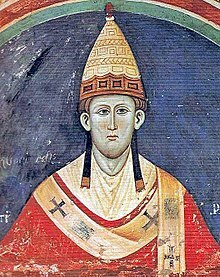 An argument with Pope Innocent III led to John's excommunication in 1209, a dispute finally settled by the king in 1213. 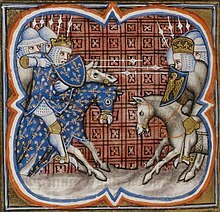 John's attempt to defeat Philip in 1214 failed due to the French victory over John's allies at the battle of Bouvines. When he returned to England, John faced a rebellion by many of his barons, who were unhappy with his fiscal policies and his treatment of many of England's most powerful nobles. Although both John and the barons agreed to the Magna Carta peace treaty in 1215, neither side complied with its conditions. Civil war broke out shortly afterwards, with the barons aided by Louis of France. It soon descended into a stalemate. John died of dysentery contracted whilst on campaign in eastern England during late 1216; supporters of his son Henry III went on to achieve victory over Louis and the rebel barons the following year. Contemporary chroniclers were mostly critical of John's performance as king, and his reign has since been the subject of significant debate and periodic revision by historians from the 16th century onwards. Historian Jim Bradbury has summarised the contemporary historical opinion of John's positive qualities, observing that John is today usually considered a "hard-working administrator, an able man, an able general". Nonetheless, modern historians agree that he also had many faults as king, including what historian Ralph Turner describes as "distasteful, even dangerous personality traits", such as pettiness, spitefulness and cruelty. These negative qualities provided extensive material for fiction writers in the Victorian era, and John remains a recurring character within Western popular culture, primarily as a villain in films and stories depicting the Robin Hood legends. 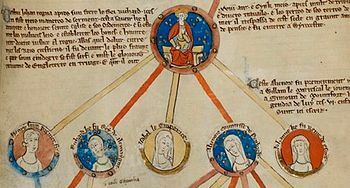 Shortly after his birth, John was passed from Eleanor into the care of a wet nurse, a traditional practice for medieval noble families. Eleanor then left for Poitiers, the capital of Aquitaine, and sent John and his sister Joan north to Fontevrault Abbey. This may have been done with the aim of steering her youngest son, with no obvious inheritance, towards a future ecclesiastical career. Eleanor spent the next few years conspiring against her husband Henry and neither parent played a part in John's very early life. John was probably, like his brothers, assigned a magister whilst he was at Fontevrault, a teacher charged with his early education and with managing the servants of his immediate household; John was later taught by Ranulph Glanville, a leading English administrator. 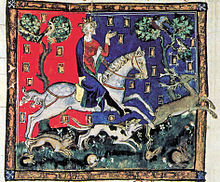 John spent some time as a member of the household of his eldest living brother Henry the Young King, where he probably received instruction in hunting and military skills. Henry II wanted to secure the southern borders of Aquitaine and decided to betroth his youngest son to Alais, the daughter and heiress of Humbert III of Savoy. As part of this agreement John was promised the future inheritance of Savoy, Piemonte, Maurienne, and the other possessions of Count Humbert. For his part in the potential marriage alliance, Henry II transferred the castles of Chinon, Loudun and Mirebeau into John's name; as John was only five years old his father would continue to control them for practical purposes. Henry the Young King was unimpressed by this; although he had yet to be granted control of any castles in his new kingdom, these were effectively his future property and had been given away without consultation. Alais made the trip over the Alps and joined Henry II's court, but she died before marrying John, which left the prince once again without an inheritance. The problems amongst John's wider family continued to grow. His elder brother Geoffrey died during a tournament in 1186, leaving a posthumous son, Arthur, and an elder daughter, Eleanor. The duchy of Brittany was given to Arthur rather than John, but Geoffrey's death brought John slightly closer to the throne of England. The uncertainty about what would happen after Henry's death continued to grow; Richard was keen to join a new crusade and remained concerned that whilst he was away Henry would appoint John his formal successor. When John's elder brother Richard became king in September 1189, he had already declared his intention of joining the Third Crusade. Richard set about raising the huge sums of money required for this expedition through the sale of lands, titles and appointments, and attempted to ensure that he would not face a revolt while away from his empire. John was made Count of Mortain, was married to the wealthy Isabel of Gloucester, and was given valuable lands in Lancaster and the counties of Cornwall, Derby, Devon, Dorset, Nottingham and Somerset, all with the aim of buying his loyalty to Richard whilst the king was on crusade. Richard retained royal control of key castles in these counties, thereby preventing John from accumulating too much military and political power, and, for the time being, the king named the four-year-old Arthur of Brittany as the heir to the throne. In return, John promised not to visit England for the next three years, thereby in theory giving Richard adequate time to conduct a successful crusade and return from the Levant without fear of John seizing power. Richard left political authority in England – the post of justiciar – jointly in the hands of Bishop Hugh de Puiset and William Mandeville, and made William Longchamp, the Bishop of Ely, his chancellor. Mandeville immediately died, and Longchamp took over as joint justiciar with Puiset, which would prove to be a less than satisfactory partnership. Eleanor, the queen mother, convinced Richard to allow John into England in his absence. For the remaining years of Richard's reign, John supported his brother on the continent, apparently loyally. Richard's policy on the continent was to attempt to regain the castles he had lost to Philip II whilst on crusade through steady, limited campaigns. He allied himself with the leaders of Flanders, Boulogne and the Holy Roman Empire to apply pressure on Philip from Germany. In 1195 John successfully conducted a sudden attack and siege of Évreux castle, and subsequently managed the defences of Normandy against Philip. The following year, John seized the town of Gamaches and led a raiding party within 50 miles (80 km) of Paris, capturing the Bishop of Beauvais. In return for this service, Richard withdrew his malevontia (ill-will) towards John, restored him to the county of Gloucestershire and made him again the Count of Mortain. After Richard's death on 6 April 1199 there were two potential claimants to the Angevin throne: John, whose claim rested on being the sole surviving son of Henry II, and young Arthur of Brittany, who held a claim as the son of Geoffrey, John's elder brother. Richard appears to have started to recognise John as his legitimate heir in the final years before his death, but the matter was not clear-cut and medieval law gave little guidance as to how the competing claims should be decided. 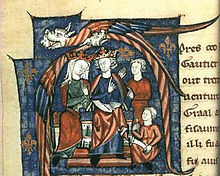 With Norman law favouring John as the only surviving son of Henry II and Angevin law favouring Arthur as the heir of Henry's elder son, the matter rapidly became an open conflict. John was supported by the bulk of the English and Norman nobility and was crowned at Westminster, backed by his mother, Eleanor. Arthur was supported by the majority of the Breton, Maine and Anjou nobles and received the support of Philip II, who remained committed to breaking up the Angevin territories on the continent. With Arthur's army pressing up the Loire valley towards Angers and Philip's forces moving down the valley towards Tours, John's continental empire was in danger of being cut in two. Warfare in Normandy at the time was shaped by the defensive potential of castles and the increasing costs of conducting campaigns. 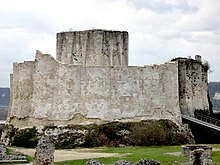 The Norman frontiers had limited natural defences but were heavily reinforced with castles, such as Château Gaillard, at strategic points, built and maintained at considerable expense. It was difficult for a commander to advance far into fresh territory without having secured his lines of communication by capturing these fortifications, which slowed the progress of any attack. Armies of the period could be formed from either feudal or mercenary forces. Feudal levies could only be raised for a fixed length of time before they returned home, forcing an end to a campaign; mercenary forces, often called Brabançons after the Duchy of Brabant but actually recruited from across northern Europe, could operate all year long and provide a commander with more strategic options to pursue a campaign, but cost much more than equivalent feudal forces. As a result commanders of the period were increasingly drawing on larger numbers of mercenaries. After his coronation, John moved south into France with military forces and adopted a defensive posture along the eastern and southern Normandy borders. Both sides paused for desultory negotiations before the war recommenced; John's position was now stronger, thanks to confirmation that Count Baldwin of Flanders and Renaud of Boulogne had renewed the anti-French alliances they had previously agreed to with Richard. The powerful Anjou nobleman William de Roches was persuaded to switch sides from Arthur to John; suddenly the balance seemed to be tipping away from Philip and Arthur in favour of John. Neither side was keen to continue the conflict, and following a papal truce the two leaders met in January 1200 to negotiate possible terms for peace. From John's perspective, what then followed represented an opportunity to stabilise control over his continental possessions and produce a lasting peace with Philip in Paris. John and Philip negotiated the May 1200 Treaty of Le Goulet; by this treaty, Philip recognised John as the rightful heir to Richard in respect to his French possessions, temporarily abandoning the wider claims of his client, Arthur. [nb 4] John, in turn, abandoned Richard's former policy of containing Philip through alliances with Flanders and Boulogne, and accepted Philip's right as the legitimate feudal overlord of John's lands in France. John's policy earned him the disrespectful title of "John Softsword" from some English chroniclers, who contrasted his behaviour with his more aggressive brother, Richard. Unfortunately, Isabella was already engaged to Hugh de Lusignan, an important member of a key Poitou noble family and brother of Raoul de Lusignan, the Count of Eu, who possessed lands along the sensitive eastern Normandy border. Just as John stood to benefit strategically from marrying Isabella, so the marriage threatened the interests of the Lusignans, whose own lands currently provided the key route for royal goods and troops across Aquitaine. Rather than negotiating some form of compensation, John treated Hugh "with contempt"; this resulted in a Lusignan uprising that was promptly crushed by John, who also intervened to suppress Raoul in Normandy. Further desertions of John's local allies at the beginning of 1203 steadily reduced John's freedom to manoeuvre in the region. He attempted to convince Pope Innocent III to intervene in the conflict, but Innocent's efforts were unsuccessful. As the situation became worse for John, he appears to have decided to have Arthur killed, with the aim of removing his potential rival and of undermining the rebel movement in Brittany. 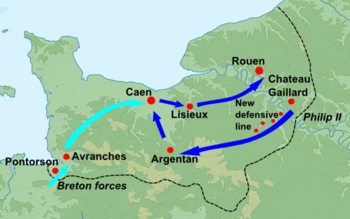 Arthur had initially been imprisoned at Falaise and was then moved to Rouen. After this, Arthur's fate remains uncertain, but modern historians believe he was murdered by John. The annals of Margam Abbey suggest that "John had captured Arthur and kept him alive in prison for some time in the castle of Rouen... when John was drunk he slew Arthur with his own hand and tying a heavy stone to the body cast it into the Seine. "[nb 7] Rumours of the manner of Arthur's death further reduced support for John across the region. Arthur's sister, Eleanor, who had also been captured at Mirebeau, was kept imprisoned by John for many years, albeit in relatively good conditions. John's royal household was based around several groups of followers. One group was the familiares regis, John's immediate friends and knights who travelled around the country with him. They also played an important role in organising and leading military campaigns. Another section of royal followers were the curia regis; these curiales were the senior officials and agents of the king and were essential to his day-to-day rule. Being a member of these inner circles brought huge advantages, as it was easier to gain favours from the king, file lawsuits, marry a wealthy heiress or have one's debts remitted. By the time of Henry II, these posts were increasingly being filled by "new men" from outside the normal ranks of the barons. This intensified under John's rule, with many lesser nobles arriving from the continent to take up positions at court; many were mercenary leaders from Poitou. These men included soldiers who would become infamous in England for their uncivilised behaviour, including Falkes de Breauté, Geard d'Athies, Engelard de Cigongé and Philip Marc. Many barons perceived the king's household as what Ralph Turner has characterised as a "narrow clique enjoying royal favour at barons' expense" staffed by men of lesser status. This trend for the king to rely on his own men at the expense of the barons was exacerbated by the tradition of Angevin royal ira et malevolentia – "anger and ill-will" – and John's own personality. From Henry II onwards, ira et malevolentia had come to describe the right of the king to express his anger and displeasure at particular barons or clergy, building on the Norman concept of malevoncia – royal ill-will. In the Norman period, suffering the king's ill-will meant difficulties in obtaining grants, honours or petitions; Henry II had infamously expressed his fury and ill-will towards Thomas Becket; this ultimately resulted in Becket's death. John now had the additional ability to "cripple his vassals" on a significant scale using his new economic and judicial measures, which made the threat of royal anger all the more serious. John was deeply suspicious of the barons, particularly those with sufficient power and wealth to potentially challenge the king. Numerous barons were subjected to John's malevolentia, even including William Marshal, a famous knight and baron normally held up as a model of utter loyalty. The most infamous case, which went beyond anything considered acceptable at the time, proved to be that of William de Braose, a powerful marcher lord with lands in Ireland. De Braose was subjected to punitive demands for money, and when he refused to pay a huge sum of 40,000 marks (equivalent to £26,666 at the time),[nb 13] his wife and one of his sons were imprisoned by John, which resulted in their death. De Braose died in exile in 1211, and his grandsons remained in prison until 1218. John's suspicions and jealousies meant that he rarely enjoyed good relationships with even the leading loyalist barons. John's lack of religious conviction has been noted by contemporary chroniclers and later historians, with some suspecting that John was at best impious, or even atheistic, a very serious issue at the time. Contemporary chroniclers catalogued his various anti-religious habits at length, including his failure to take communion, his blasphemous remarks, and his witty but scandalous jokes about church doctrine, including jokes about the implausibility of the Resurrection. They commented on the paucity of John's charitable donations to the church. Historian Frank McLynn argues that John's early years at Fontevrault, combined with his relatively advanced education, may have turned him against the church. Other historians have been more cautious in interpreting this material, noting that chroniclers also reported John's personal interest in the life of St Wulfstan of Worcester and his friendships with several senior clerics, most especially with Hugh of Lincoln, who was later declared a saint. Financial records show a normal royal household engaged in the usual feasts and pious observances – albeit with many records showing John's offerings to the poor to atone for routinely breaking church rules and guidance. John had already begun to improve his Channel forces before the loss of Normandy and he rapidly built up further maritime capabilities after its collapse. Most of these ships were placed along the Cinque Ports, but Portsmouth was also enlarged. By the end of 1204 he had around 50 large galleys available; another 54 vessels were built between 1209 and 1212. William of Wrotham was appointed "keeper of the galleys", effectively John's chief admiral. Wortham was responsible for fusing John's galleys, the ships of the Cinque Ports and pressed merchant vessels into a single operational fleet. John adopted recent improvements in ship design, including new large transport ships called buisses and removable forecastles for use in combat. During the truce of 1206–1208, John focused on building up his financial and military resources in preparation for another attempt to recapture Normandy. John used some of this money to pay for new alliances on Philip's eastern frontiers, where the growth in Capetian power was beginning to concern France's neighbours. By 1212 John had successfully concluded alliances with Renault of Dammartin, who controlled Boulogne, and Count Ferdinand of Flanders, as well as Otto IV, a contender for the crown of Holy Roman Emperor in Germany; Otto was also John's nephew. The invasion plans for 1212 were postponed because of fresh English baronial unrest about service in Poitou. Philip seized the initiative in 1213, sending his son, Prince Louis, to invade Flanders with the intention of next launching an invasion of England. John was forced to postpone his own invasion plans to counter this threat. He launched his new fleet to attack the French at the harbour of Damme. The attack was a success, destroying Philip's vessels and any chances of an invasion of England that year. John hoped to exploit this advantage by invading himself late in 1213, but baronial discontent again delayed his invasion plans until early 1214, in what would prove to be his final Continental campaign. In the late 12th and early 13th centuries the border and political relationship between England and Scotland was disputed, with the kings of Scotland claiming parts of what is now northern England. John's father, Henry II, had forced William of Scotland to swear fealty to him at the Treaty of Falaise in 1174. This had been rescinded by Richard I in exchange for financial compensation in 1189, but the relationship remained uneasy. John began his reign by reasserting his sovereignty over the disputed northern counties. He refused William's request for the earldom of Northumbria, but did not intervene in Scotland itself and focused on his continental problems. The two kings maintained a friendly relationship, meeting in 1206 and 1207, until it was rumoured in 1209 that William was intending to ally himself with Philip II of France. John invaded Scotland and forced William to sign the Treaty of Norham, which gave John control of William's daughters and required a payment of £10,000. This effectively crippled William's power north of the border, and by 1212 John had to intervene militarily to support the Scottish king against his internal rivals. 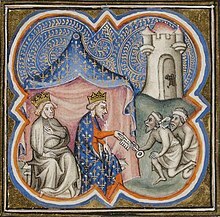 [nb 16] John made no efforts to reinvigorate the Treaty of Falaise, though, and both William and Alexander remained independent kings, supported by, but not owing fealty to, John. John treated the interdict as "the equivalent of a papal declaration of war". He responded by attempting to punish Innocent personally and to drive a wedge between those English clergy that might support him and those allying themselves firmly with the authorities in Rome. John seized the lands of those clergy unwilling to conduct services, as well as those estates linked to Innocent himself; he arrested the illicit concubines that many clerics kept during the period, only releasing them after the payment of fines; he seized the lands of members of the church who had fled England, and he promised protection for those clergy willing to remain loyal to him. In many cases, individual institutions were able to negotiate terms for managing their own properties and keeping the produce of their estates. By 1209 the situation showed no signs of resolution, and Innocent threatened to excommunicate John if he did not acquiesce to Langton's appointment. When this threat failed, Innocent excommunicated the king in November 1209. Although theoretically a significant blow to John's legitimacy, this did not appear to greatly worry the king. Two of John’s close allies, Emperor Otto and Count Raymond VI of Toulouse, had already suffered the same punishment themselves, and the significance of excommunication had been somewhat devalued. John simply tightened his existing measures and accrued significant sums from the income of vacant sees and abbeys: one 1213 estimate, for example, suggested the church had lost an estimated 100,000 marks (equivalent to £66,666 at the time) to John. Official figures suggest that around 14% of annual income from the English church was being appropriated by John each year. Innocent gave some dispensations as the crisis progressed. Monastic communities were allowed to celebrate mass in private from 1209 onwards, and late in 1212 the viaticum for the dying was authorised. The rules on burials and lay access to churches appear to have been steadily circumvented, at least unofficially. Although the interdict was a burden to much of the population, it did not result in rebellion against John. By 1213, though, John was increasingly worried about the threat of French invasion. Some contemporary chroniclers suggested that in January Philip II of France had been charged with deposing John on behalf of the papacy, although it appears that Innocent merely prepared secret letters in case Innocent needed to claim the credit if Philip did successfully invade England. Under mounting political pressure, John finally negotiated terms for a reconciliation, and the papal terms for submission were accepted in the presence of the papal legate Pandulph in May 1213 at the Templar Church at Dover. As part of the deal, John offered to surrender the Kingdom of England to the papacy for a feudal service of 1,000 marks (equivalent to £666 at the time) annually: 700 marks (£466) for England and 300 marks (£200) for Ireland, as well as recompensing the church for revenue lost during the crisis. The agreement was formalised in the Bulla Aurea, or Golden Bull. This resolution produced mixed responses. Although some chroniclers felt that John had been humiliated by the sequence of events, there was little public reaction. Innocent benefited from the resolution of his long-standing English problem, but John probably gained more, as Innocent became a firm supporter of John for the rest of his reign, backing him in both domestic and continental policy issues. Innocent immediately turned against Philip, calling upon him to reject plans to invade England and to sue for peace. John paid some of the compensation money he had promised the church, but he ceased making payments in late 1214, leaving two-thirds of the sum unpaid; Innocent appears to have conveniently forgotten this debt for the good of the wider relationship. The first part of the campaign went well, with John outmanoeuvring the forces under the command of Prince Louis and retaking the county of Anjou by the end of June. John besieged the castle of Roche-au-Moine, a key stronghold, forcing Louis to give battle against John's larger army. The local Angevin nobles refused to advance with the king; left at something of a disadvantage, John retreated back to La Rochelle. Shortly afterwards, Philip won the hard-fought battle of Bouvines in the east against Otto and John's other allies, bringing an end to John's hopes of retaking Normandy. A peace agreement was signed in which John returned Anjou to Philip and paid the French king compensation; the truce was intended to last for six years. John arrived back in England in October. John met the rebel leaders at Runnymede, near Windsor Castle, on 15 June 1215. Langton's efforts at mediation created a charter capturing the proposed peace agreement; it was later renamed Magna Carta, or "Great Charter". The charter went beyond simply addressing specific baronial complaints, and formed a wider proposal for political reform, albeit one focusing on the rights of free men, not serfs and unfree labour. It promised the protection of church rights, protection from illegal imprisonment, access to swift justice, new taxation only with baronial consent and limitations on scutage and other feudal payments. A council of twenty-five neutral barons would be created to monitor and ensure John's future adherence to the charter, whilst the rebel army would stand down and London would be surrendered to the king. The rebel barons responded by inviting Prince Louis of France to lead them: Louis had a claim to the English throne by virtue of his marriage to Blanche of Castile, a granddaughter of Henry II. Philip may have provided him with private support but refused to openly support Louis, who was excommunicated by Innocent for taking part in the war against John. Louis' planned arrival in England presented a significant problem for John, as the prince would bring with him naval vessels and siege engines essential to the rebel cause. Once John contained Alexander in Scotland, he marched south to deal with the challenge of the coming invasion. In September 1216 John began a fresh, vigorous attack. He marched from the Cotswolds, feigned an offensive to relieve the besieged Windsor Castle, and attacked eastwards around London to Cambridge to separate the rebel-held areas of Lincolnshire and East Anglia. 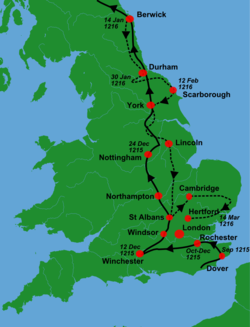 From there he travelled north to relieve the rebel siege at Lincoln and back east to King's Lynn, probably to order further supplies from the continent. [nb 17] In King's Lynn, John contracted dysentery, which would ultimately prove fatal. Meanwhile, Alexander II invaded northern England again, taking Carlisle in August and then marching south to give homage to Prince Louis for his English possessions; John narrowly missed intercepting Alexander along the way. 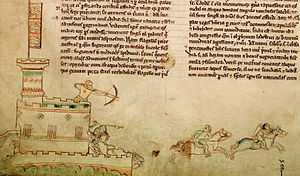 Tensions between Louis and the English barons began to increase, prompting a wave of desertions, including William Marshal's son William and William Longespée, who both returned to John's faction. John's illness grew worse and by the time he reached Newark Castle he was unable to travel any farther; John died on the night of 18 October. 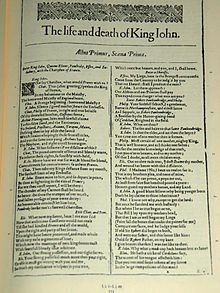 Numerous – probably fictitious – accounts circulated soon after his death that he had been killed by poisoned ale, poisoned plums or a "surfeit of peaches". 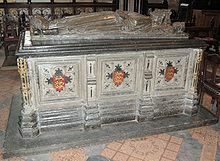 His body was escorted south by a company of mercenaries and he was buried in Worcester Cathedral in front of the altar of St Wulfstan. A new sarcophagus with an effigy was made for him in 1232, in which his remains now rest. In the aftermath of John's death William Marshal was declared the protector of the nine-year-old Henry III. The civil war continued until royalist victories at the battles of Lincoln and Dover in 1217. Louis gave up his claim to the English throne and signed the Treaty of Lambeth. The failed Magna Carta agreement was resuscitated by Marshal's protectorate and reissued in an edited form in 1217 as a basis for future government. Henry III continued his attempts to reclaim Normandy and Anjou until 1259, but John's continental losses and the consequent growth of Capetian power in the 13th century proved to mark a "turning point in European history". John's first wife, Isabel, Countess of Gloucester, was released from imprisonment in 1214; she remarried twice, and died in 1217. John's second wife, Isabella of Angoulême, left England for Angoulême soon after the king's death; she became a powerful regional leader, but largely abandoned the children she had had by John. John had five legitimate children, all by Isabella. 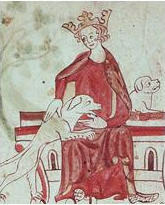 His eldest son, Henry III, ruled as king for the majority of the 13th century. Richard became a noted European leader and ultimately the King of the Romans in the Holy Roman Empire. Joan married Alexander II of Scotland to become his queen consort. Isabella married the Holy Roman Emperor Frederick II. His youngest daughter, Eleanor, married William Marshal's son, also called William, and later the famous English rebel Simon de Montfort. John had a number of illegitimate children by various mistresses, including nine sons – Richard, Oliver, John, Geoffrey, Henry, Osbert Gifford, Eudes, Bartholomew and probably Philip – and three daughters – Joan, Maud and probably Isabel. Of these, Joan became the most famous, marrying Prince Llywelyn the Great of Wales. Historical interpretations of John have been subject to considerable change over the years. Medieval chroniclers provided the first contemporary, or near contemporary, histories of John's reign. One group of chroniclers wrote early in John's life, or around the time of his accession, including Richard of Devizes, William of Newburgh, Roger of Hoveden and Ralph de Diceto. These historians were generally unsympathetic to John's behaviour under Richard's rule, but slightly more positive towards the very earliest years of John's reign. Reliable accounts of the middle and later parts of John's reign are more limited, with Gervase of Canterbury and Ralph of Coggeshall writing the main accounts; neither of them were positive about John's performance as king. 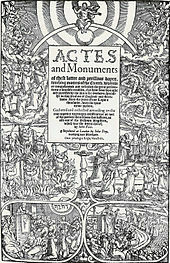 Much of John's later, negative reputation was established by two chroniclers writing after the king's death, Roger of Wendover and Matthew Paris, the latter claiming that John attempted conversion to Islam, a story which is considered to be untrue by modern historians. By the Victorian period in the 19th century historians were more inclined to draw on the judgements of the chroniclers and to focus on John's moral personality. Kate Norgate, for example, argued that John's downfall had been due not to his failure in war or strategy, but due to his "almost superhuman wickedness", whilst James Ramsay blamed John's family background and his cruel personality for his downfall. Historians in the "Whiggish" tradition, focusing on documents such as the Domesday Book and Magna Carta, trace a progressive and universalist course of political and economic development in England over the medieval period. These historians were often inclined to see John's reign, and his signing of Magna Carta in particular, as a positive step in the constitutional development of England, despite the flaws of the king himself. Winston Churchill, for example, argued that "[w]hen the long tally is added, it will be seen that the British nation and the English-speaking world owe far more to the vices of John than to the labours of virtuous sovereigns". Most historians today, including John's recent biographers Ralph Turner and Lewis Warren, argue that John was an unsuccessful monarch, but note that his failings were exaggerated by 12th- and 13th-century chroniclers. Jim Bradbury notes the consensus of contemporary historians that John was a "hard-working administrator, an able man, an able general", albeit, as Turner suggests, with "distasteful, even dangerous personality traits", including pettiness, spitefulness and cruelty. John Gillingham, author of a major biography of Richard I, follows this line too, although he considers John a less effective general than do Turner or Warren; Bradbury takes a moderate line, but suggests that in recent years modern historians have been overly lenient towards John's numerous faults. Popular historian Frank McLynn maintains a counter-revisionist perspective on John, arguing that the king's modern reputation amongst historians is "bizarre", and that as a monarch John "fails almost all those [tests] that can be legitimately set". Nineteenth-century fictional depictions of John were heavily influenced by Sir Walter Scott's historical romance, Ivanhoe, which presented "an almost totally unfavourable picture" of the king; the work drew on Victorian histories of the period and on Shakespeare's play. Scott's work influenced the late 19th-century children's writer Howard Pyle's book The Merry Adventures of Robin Hood, which in turn established John as the principal villain within the traditional Robin Hood narrative. During the 20th century, John was normally depicted in fictional books and films alongside Robin Hood. Sam De Grasse's role as John in the black-and-white 1922 film version shows John committing numerous atrocities and acts of torture. Claude Rains played John in the 1938 colour version alongside Errol Flynn, starting a trend for films to depict John as an "effeminate ... arrogant and cowardly stay-at-home". The character of John acts either to highlight the virtues of King Richard, or contrasts with the Sheriff of Nottingham, who is usually the "swashbuckling villain" opposing Robin. An extreme version of this trend can be seen in the Disney cartoon version, for example, which depicts John, voiced by Peter Ustinov, as a "cowardly, thumbsucking lion". Popular works that depict John beyond the Robin Hood legends, such as James Goldman's play and later film, The Lion in Winter, set in 1183, commonly present him as an "effete weakling", in this instance contrasted with the more masculine Henry II. ^ a b Bradbury (2007), p.353. ^ Barlow, p.293; Warren p.39. ^ a b c Warren, p.40. ^ a b c Warren, p.43. ^ a b c d Warren, p.44. ^ a b Warren, p.45. ^ a b Warren, p.46. ^ a b c d Warren, p.47. ^ Barlow, p.305; Turner, p.48. ^ a b Warren, p.53. ^ Warren, pp.57–8; Barlow, p.280. ^ Carpenter (2004), p.264; Turner, p.100. ^ a b Warren, p.54. ^ a b c d e Turner, p.98. ^ a b Warren, p.55. ^ a b c d e f g Turner, p.99. ^ a b c d e Turner, p.100. ^ a b c d e f Turner, p.101. ^ a b McLynn, p.306. ^ a b Warren, p.83. ^ a b c d e f g h Turner, p.102. ^ Norgate (1902), p.96; Turner, p.98; Warren, p.88; McLynn, p.473. ^ a b c d e Turner, p.149. ^ Warren, p.178; Turner, p.156. ^ a b Warren, p.132. ^ Warren, p.132; Huscroft, p.171. ^ McLynn, p.366; Hunnisett, pp.1–3. ^ a b Warren, pp.143–4. ^ a b Carpenter (2004), p.273. ^ Lawler and Lawler, p.6. ^ a b c Turner, p.87. ^ a b c Carpenter (2004), p.272. ^ Hodgett, p. 57; Johnson, p.142. ^ Turner, pp.144–5; Church (1999), p.133. ^ a b Turner, p.145. ^ a b Huscroft, p.170; Mason, p.128. ^ a b Warren, p.184. ^ Warren, p.184; Turner, p.23. ^ a b Warren, p.185; Turner, p.169. ^ a b c Turner, p.166. ^ Turner, p.166, Vincent, p.193. ^ Vincent, p.197, attributing the original idea to a private communication from Sir James Holt. ^ a b Vincent, pp.174–5. ^ Turner, p.98; Vincent, p.196. ^ Jordan, cited Turner, p.12. ^ Turner, p.120; Carpenter (2004), p.276. ^ a b c d e f Turner, p.106. ^ a b c d e Turner, pp.106–7. ^ a b c d e f Turner, p.107. ^ a b Barlow, p.336. ^ a b Warren, p.123. ^ a b c d e Turner, p.108. ^ a b c Turner, p.109. ^ Carpenter (2004), p.277; Duncan, p.251. ^ a b c Carpenter (2004), p.277. ^ Carpenter, p.277; Duncan, p.264. ^ a b Carpenter (2004), p.278. ^ Carpenter (2004), p.282; Duffy, pp.242–3. ^ a b Carpenter (2004), p.284. ^ a b Huscroft, p.189; Turner, p.121. ^ a b Turner, p.125. ^ a b c Turner, p.126. ^ a b Turner, p.127. ^ Turner, p.128; Harper-Bill, p.304. ^ a b c Turner, p.128. ^ a b c d Turner, p.131. ^ a b Harper-Bill, p.304. ^ Bartlett, pp.404–5; Turner, p.133. ^ Turner, p.133; Lloyd, p.213. ^ Turner, p.133; Harper-Bill, p.308. ^ a b Turner, p.134. ^ a b Carpenter (2004), p.286. ^ a b Warren, p.222. ^ a b c Warren, p.224. ^ a b Turner, p.178. ^ a b c d Turner, p.180. ^ a b Turner, p.189. ^ a b c Turner, p.190. ^ a b Turner, p.192. ^ Turner, p.192 citing Brown, pp.10–11; Turner, p.193. ^ a b c d e Turner, p.193. ^ a b c Duncan, p.267. ^ a b Turner, pp.191–2. ^ a b Turner, p.194. ^ a b Warren, p.253. ^ a b Warren, p.254. ^ Warren, pp.284–5; Barlow, p.356. ^ Turner, p.195; Barlow, p.357. ^ a b McLynn, p.460. ^ Danziger and Gillinham, p.271; Huscroft, p.151. ^ Holt (1963), p.19, cited Gillingham (2007) p.4. ^ Warren, p.7; Gillingham (2007), p.15. ^ a b Bevington, p.432. ^ Norgate (1902), p.286; Ramsay, p.502. ^ a b Dyer, p.4; Coss, p.81. ^ Galbraith, pp.128–30, cited Gillingham (2007), p.1. ^ Huscroft, p.174; Barlow, p.353. ^ Bradbury (2007), p.353; Turner, p.23. ^ Curren-Aquino (1989a), p.19. ; Harris, p.91. ^ Curren-Aquino (1989a), p.19; McEachern, p.329; Bevington, p.454. ^ a b Potter, p.210. Duffy, Sean. (2007) "John and Ireland: the Origins of England’s Irish Problem," in Church (ed) 2007.